Gin Stone sculpture at the opening reception for Biophilia at the Sargent Gallery. On Sunday night, as the sun set in Aquinnah, Barbara Norfleet was waxing poetic about swamps. Formerly the Gay Head Gallery, owner Megan Otten-Sargent, along with co-curator and daughter Anastasia Sargent, curates the gallery’s shows with a conservation mission in mind. 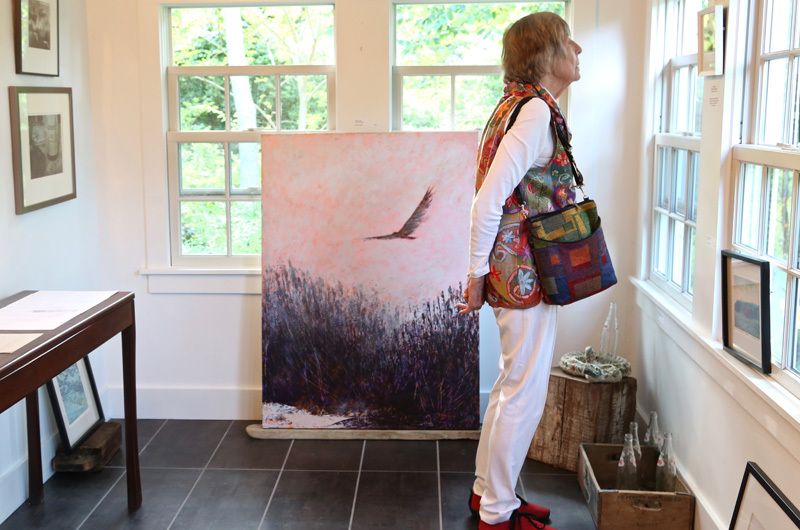 Ms. Ottens-Sargent hadn’t intended to re-open the gallery with an environmental mission, but when she picked up a small book at the Chicken Alley Thrift Shop about protecting the wolves in Yellowstone, something clicked. Several photographs of wolves by Mr. Brandenburg, who is based in Minnesota, are included in the Biophilia exhibit. Artist Gin Stone’s “humane taxidermy” was on also display. 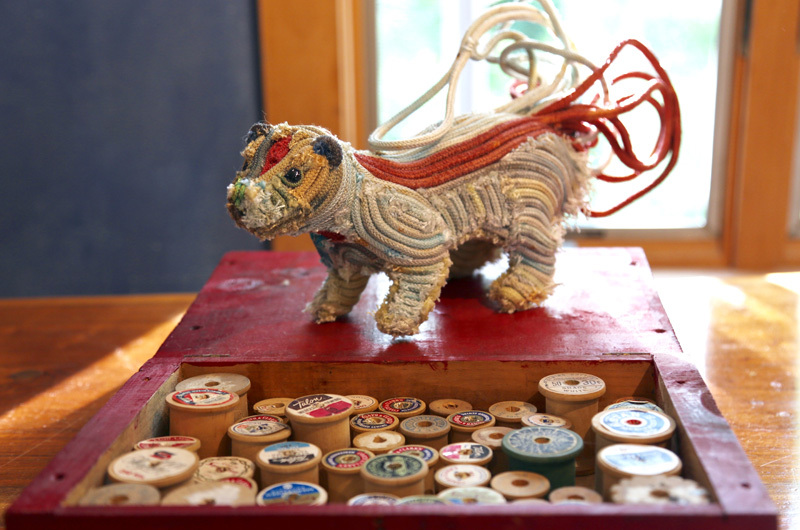 Ms. Stone uses reclaimed longline fishing gear that would otherwise end up in landfills to create her animal sculptures. She cleans and dyes the gear to use it as the pelt or fur of a sculpture. Ms. Ottens-Sargent also invited Tracy Davids, a board member of the Fund for Wild Nature, to speak at the Biophilia’s opening. Made up of nine board members with backgrounds in environmental activism, the fund gives grants to small environmental groups all over the North America that protect wildlife and wild places. A discussion about activism and environmentalism followed. The Sargent Gallery is open from 11 a.m. to 6 p.m., Thursday through Monday and by appointment. Biophilia runs through August 17. Visit sargentgallery.org.